For a town surrounded on three sides by a river, West Linn is accustomed to flooding — and for good reason: Substantial flooding of the Willamette and Tualatin rivers has been a common occurance in our history and will likely continue in the future. The winter flood of 1890 innudated the power plant and paper mill located along the river, as well as many homes and streets built close to the river. The Oregon Courier newspaper included a quirky tale on Feb. 14: "One of the queerest incidents that ever happened came to the writer's ears last week. One day when the river was at its highest, an old pig belonging to Flave Painter chanced to step on a raft as it started to float down the river. It went over the falls and the owner supposed the pig had drowned. But lo and behold, when he went out in the yard the next day, there was his porker looking as smiling as could be, and seemingly none the worse for the boat ride. This story seems incredible but it is nonetheless true." In more serious reporting of the flood the paper said, "The losses of the W.P.&P. on the west side do not exceed $15,000. The boilers are all right, and the ruined brick boiler house will be replaced by a wooden building lined within by sheet iron, leaving an air space in between the boiler iron and the building." and "The swarm of laborers which now have employment on the streets and wrecked buildings circulate a deal of money and shopkeepers report a livelier trade than they have had for numerous weeks." 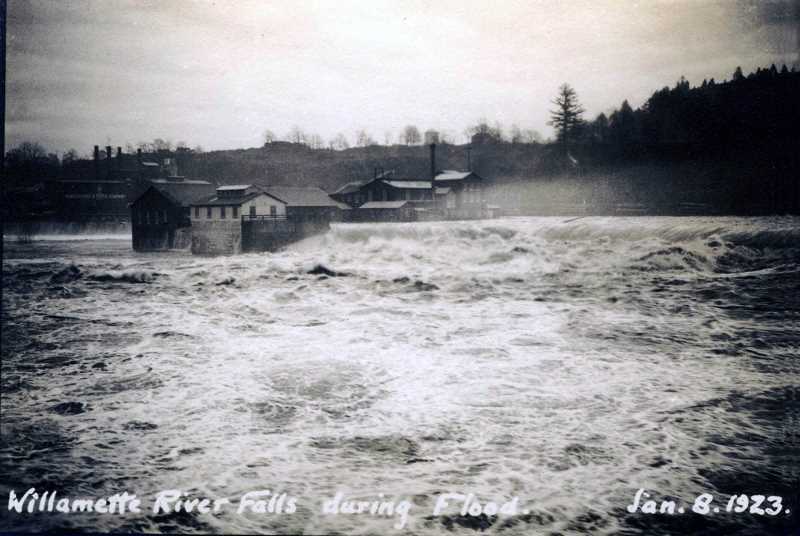 "The mechanical pulp mill, which stands on the very edge of the falls and was as fully exposed as any building, resumed grinding on Saturday about 48 hours after water was at its highest stage…The old Indians around town make us ashamed when we point with pride to the high water mark of 1890…one winter the snow lay five feet on a level. A warm rain and Chinook (wind) came and melted the snow and the water rose to the upper rim of the bluff in Oregon City. 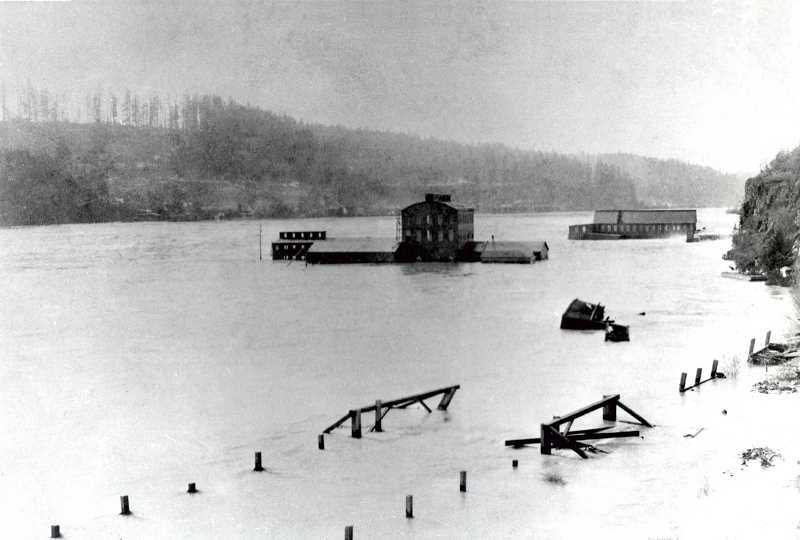 In January 1923 the river again flooded for what is considered the fourth largest flood in recorded history on the Willamette. During that flood the paper reported: "Judge Thomas F. Ryan, well known throughout Oregon as a financier and politician narrowly escaped death in the flood here yesterday when he stepped on some drift jammed against the dock, thinking he was walking on deck planking. He sank at once into the mass of debris. Two passerby who refused to give their names, risked their lives in hauling the submerged banker to safety." 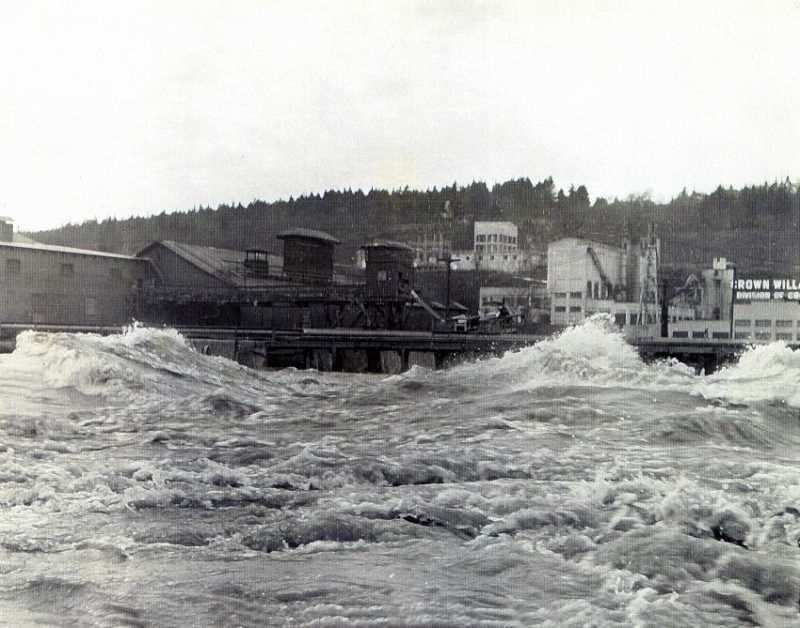 The water was not quite as high in the winter of 1943 but nonetheless more than a million boardfeet of logs from upriver booms were loosed from their moorings and carried over the falls, tearing away docks and other riverside structures along the way. Resourceful scavangers were able to salvage logs and resell them back to their owners (timber companies branded their logs for identification). 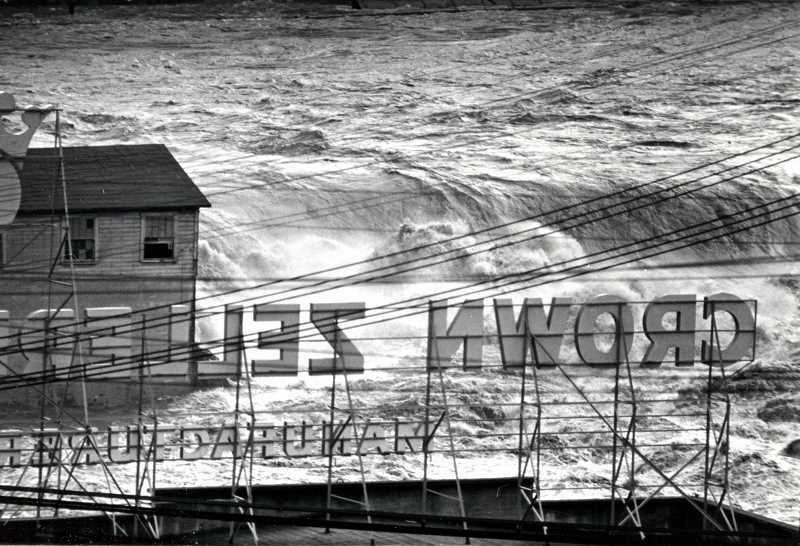 "A wooden superstructure atop the Willamette River Dam at Oregon City gave way. A towboat and barge crashed through the gap and shattered at the bottom of the falls here, but no crewmen were aboard," the newspaper reported. The Christmas-time floods of 1963 were more severe, on par with the water levels from 1890. Reportedly river water submerged more than 152,000 acres of once dry land and peaked more than 20 feet above flood stage in Portland.